CHIPPEWA FALLS, Wis. (AP) — A closed tavern in Chippewa Falls that appeared slated for demolition has been given new life as it has reopened as a church. River City Community Church has leased the building, moving into the building in August that was known as The Lodge for the past decade. 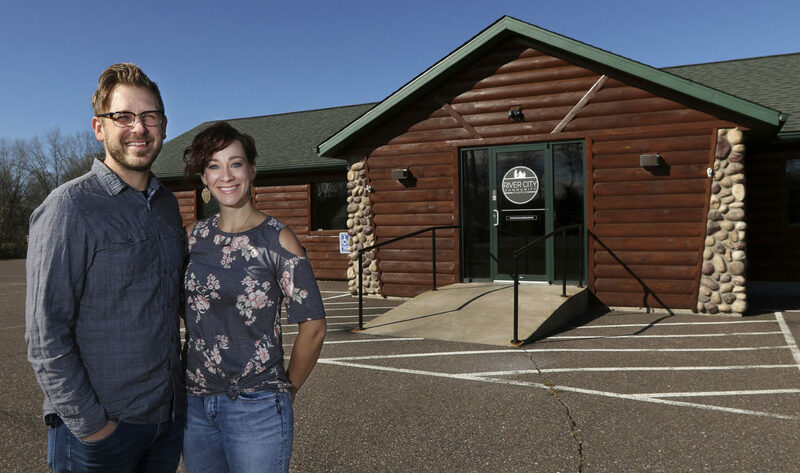 Chris and Jaci Uttecht, co-leaders of the church, said their congregation was founded earlier this year with a group of about 20 meeting in their home. It quickly grew, and they began looking for space. They saw a sign on the building that it was available for lease. When the Uttechts first walked in the building, they had a vision of how it could be transformed into a church. The front bar area was still there; all the bar signs and kegs and taps were gone. There is room in the front area for maybe a dozen tables. However, through a narrow hallway, the building opens up into a banquet hall, which was perfect for creating a church setting. First, they needed to clean up debris that had sat in the building for a year. Even though it is a relatively new building, it was showing signs of disrepair and neglect. A meat locker/cooler area has been transformed into a children’s playroom. A main office was turned into a nursery. An outdoor smoking area was turned into a toddlers’ play area. Shelves were removed, walls were painted and tables and chairs were added to create the warm interior. “It was a lot of cleaning up, hiding wires, moving cabinets,” Chris Uttecht said. Last year, Lodge owner Tim Swoboda announced he had sold the building to Menards. Swoboda said Menards approached him with the offer. CN railroad opened an intermodal rail terminal — essentially an outdoor distribution center — in February 2012, on nearby property alongside River Country Co-op’s site. CN ships its products from across the world into the rail yard, where the containers are unloaded and shipped around the Midwest, with Menards as CN’s largest client. In September 2013, River Country Co-op installed a rail container loading facility at its headquarters, allowing the company to unload semitrucks filled with grain and into rail containers that are shipped to Asia. It appeared that the building was going to be torn down to allow for expansion of the rail yard. Swoboda purchased the building and opened The Lodge in 2009. In 2012, Swoboda put a 4,000-square-foot addition on the building at a cost of $1 million, city records show. He estimates the total building is 9,000 square feet, on a lot of about 1.25 acres. It is unclear why Menards opted to turn around and make the building available for lease. Menards officials couldn’t be reached for comment. The liquor license that Swoboda held was returned to the city, where it was claimed by another business, so it would have been a long shot for another tavern to open in the space. The Uttechts also don’t know why the building is still standing but they are happy it was available. They signed a long-term lease, knowing at the end of that period they could wind up having to move if Menards decides to raze the site. River City Community Church has a service at 10:30 a.m. on Sundays, followed by a potluck brunch at 11:45 a.m. Students in grades 6-12 are welcome to return at 6:30 p.m. that evening for a youth gathering. Volleyball courts in the rear of the building have been cleaned up and will be used frequently, the Uttechts said. The church members purchased the furnishings through various websites or obtained them through donations. While the church is new, the Uttechts said they are averaging 80 people on Sundays, as congregation members are inviting other family, friends and neighbors to visit.